Mill-Max has expanded its USB family to include two new mini USB receptacles. 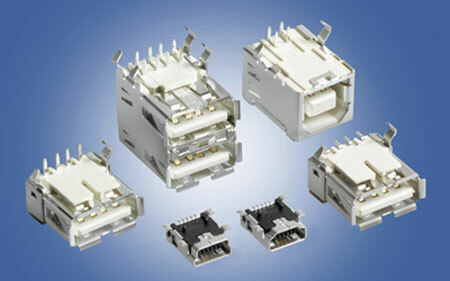 These mini USB connectors offer more options when smaller solutions are necessary. The mini USB receptacles are for surface mount applications. They are smaller and lighter than existing USB connectors for portable and handheld devices. They feature 5 pin (one ID pin,) and 0.8mm pitch, thereby, reducing the mounting space. Both are fully compliant with current USB 2.0 specifications. The mini USB connectors come packaged on tape and reel. Our standard USB connectors are designed for thru-hole or surface mount at the edge of a printed circuit board. -Four types of standard USB receptacles for through-hole & surface mount: single type "A" SMT, single & dual type "A" through-hole, and a type "B" through-hole. -Kinked locating legs for secure PCB retention. Fully compatible with USB specifications. -Passes 16MHz Signal Attenuation per ASTM-D-4566.